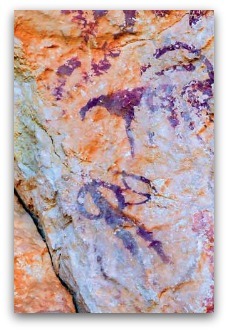 In 1868, Antonio Góngora Martínez, an Almeria local, discovered a special cave painting in Los Vélez, the Indalo man, along with other icons. 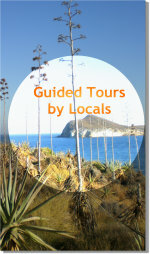 The region of Los Vélez is located north of the province of Almeria. On December 5, 1998 this ancient 'rock art' was declared World Heritage Site by the UNESCO. These paintings belong to the Paleolithic prehistory. While there have been further discoveries in Almeria Province in recent times, the number of cave paintings in Los Velez area has not been increased in terms of new findings since 1915 when Breuil and Motos made an inventory of 'art' caves in that region. Representations of the Cueva de Los Letreros (Cave of the signs) are schematic and its predominant color is red. Archers, wizards and idols are some of the human figures that appear in the cave. It is here, where the "Indalo" painting was discovered, an anthropomorphic sign that has become the symbol of all Almeria Province. Archaeologists found that the INDALO was the representation of a prehistoric God of a monotheistic city - which holds the Rainbow with open arms, the first covenant of God with man and security against possible floods (Genesis 9-13). As a matter of fact, it hardly ever rains in Almeria and the sun shines bright, being the place with most sunshine and clarity of entire Europe. The Indalo, named in memory of San Indalecio, precursor of the Catholic religion in the South Peninsula, means in the Iberian language, Indal Eccius (messenger of the gods). Sergio Leone and Clint Eastwood became famous, thanks to their spaghetti western movies shot in Almeria and many other actors and directors followed their footprints, choosing locations within this province. And where on earth do people accomplish to grow tons and tons of vegetables in the Desert and supply entire Europe with fresh tomatoes throughout the year? Weird or a miracle? Just in case, I have placed Indalo icons all over the place: on my desk, paintings on the wall, and of course I always wear this unique and beautiful Mystical Indalo Charm Bracelet, created with love by Melanie , a real artist, who is luckily living in the cradle of the Indalo. Go into any gift or souvenir shop in the city of Almería or the tourist resorts of Roquetas de Mar and Mojácar and you will find key rings, thimbles, teaspoons and even jewellery - all bearing the Indalo symbol. Furthermore, on the road to Almería airport a giant statue of the Indalo stands prominently on a roundabout towering over the 'Welcome to Almería' sign. 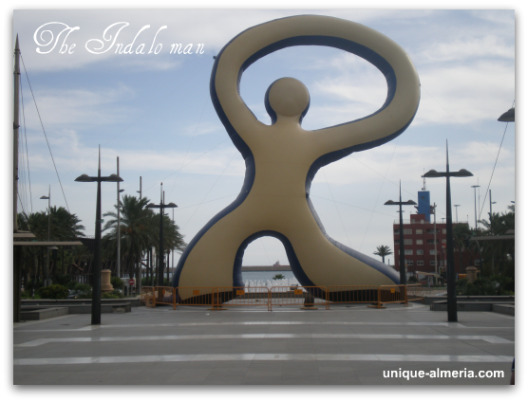 So what is so special about this stick figure man that the Almeriense, the people of Almería, call the Indalo? Well, in 1868, cave paintings were discovered in a cave in the north of the province of Almería. These cave paintings were about 6,000 years old and one of them, a man with his arms held out to his sides and holding a rainbow above his head, has come to be the symbol of Almería. The Indalo allegedly brings good luck, health and love to those who own one. 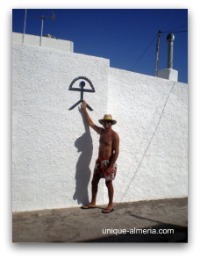 It is customary in this region of Spain to paint the Indalo symbol on the front of houses and businesses to protect them from evil. The interesting thing to note, however, is that this practice of warding off evil spirits by having the Indalo symbol above the door has been going on for centuries, so the locals must have known about the symbol before the cave discovery. In olden days fishermen used to pin the symbol on their doors before going out to sea as a protection against storms and as a guarantee of obtaining a good catch. Perhaps they still do! The cave in question, la Cueva de los Letreros, was declared a National Monument in 1924. It is one of a number of caves situated in the Sierra de María in the north of the province of Almería. Los Letreros lies between the towns of Vélez Blanco and Vélez Rubio. Vélez Blanco is particularly worth a visit. It is a typical pueblo blanco with its whitewashed houses nestling at the foot of a rocky outcrop upon which stands a majestic castle.